Aditi Arya, 21 years old from Delhi, was crowned FBB Femina Miss India 2015 at the annual ceremony held on March 28th at Mumbai. Aditi, a research analyst and a Business Studies graduate from Delhi University earned herself the right to represent India at Miss World 2015 to be held in December. She will try to be a successor of present Miss World Rolene Strauss. Aishwarya Rai from India and Miss World winner 2014 is considered among the most beautiful Miss World ever. 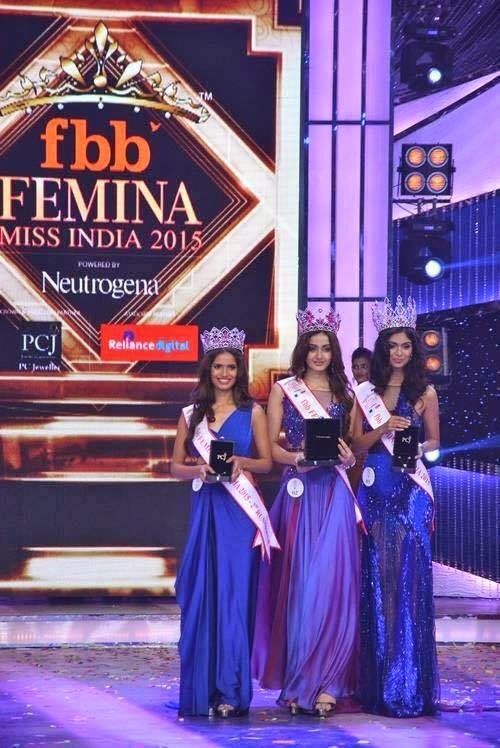 Crowned as 1st and 2nd runner-ups respectively were Aafreen Rachel Vaz and Vartika Singh. Vartika Singh hails from Lucknow, my hometown. She works with Public health department of World Bank as a consultant. The Miss India Organization will announce soon in which international events they will compete. In all likelihood, Afreen will represent India at Miss Earth 2015 and Vartika will go to Miss Grand International. Aditi Arya was also the winner of Miss Delhi, the same title that Koyal Rana , Miss India 2014 had won before winning the national pageant. India has 5 Miss World crown to its credit second only to Venezuela which has 6. Aishwaraya Rai from India and Miss World 2014 is considered the most beautiful Miss World so far. Best of Luck to Aditi Arya, Afreen Vaz and Vartika Singh.